Halve peaches, remove cores, and set aside. Add chopped almonds, brown sugar, flour, salt, cold butter to a bowl. Mix until large crumbs form. Heat the grill pan over high heat. Grease the pan with some oil if needed. Place the peaches cut side-down into the pan and grill for approx. 3 – 5 min, or until grill marks have formed. 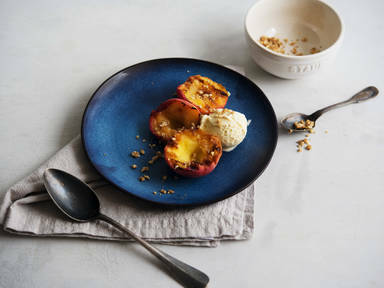 Plate the grilled peaches and serve with ice cream and crumble. Enjoy!